Gbarnway, Lofa County – (USAID) The United States Government has turned over the completed and operational Gbarnway Solar Electricity Pilot Project to the people of Gbarnway in Lofa County. The project, funded by the United States Agency for International Development (USAID), is a 24 kilowatt renewable off-grid electricity system that will provide power to 152 households, 5 streetlights, and 5 public facilities, including the community school and clinic. In remarks at the handover ceremony held in Gbarnway on Monday, July 20, U.S. Ambassador to Liberia Deborah Malac said affordable electricity, like that provided to the people of Gbarnway, can generate significant economic benefits by creating new opportunities for businesses, including pharmacies and clinics, by providing a range of products and services that could not be provided without electricity and refrigeration. Ambassador Malac said the Gbarnway Solar Power Project represents a small but important step in the effort to provide rural electrification for Liberia. “That is why I am also asking all of you in the Gbarnway Community and our Government of Liberia counterparts to demonstrate your commitment to manage and sustain this project,” the U.S. Envoy said. She added that the United States Government, through its Power Africa initiative, remains fully committed to working with the Government of Liberia through the Rural and Renewable Energy Agency (RREA) to bring electricity to all homes in Liberia. Also speaking during the handover ceremony, RREA Executive Director Augustus Goanue thanked the U.S. Government for the positive intervention in the Liberian energy sector. 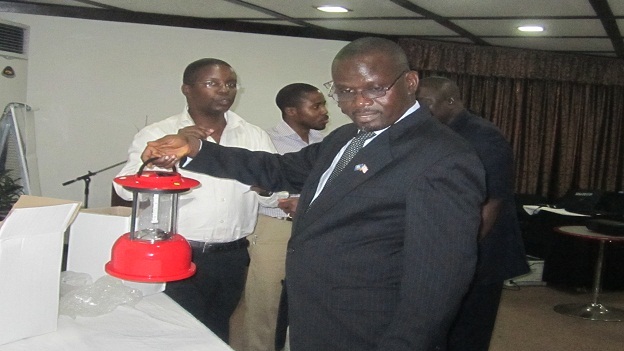 Director Goanue noted that in 2009, USAID worked with the Government of Liberia to develop the country’s National Energy Policy. He added that as a result of that collaboration, President Ellen Johnson-Sirleaf last week signed into law the act creating the RREA to promote the commercial development and supply of modern energy products and services to rural areas through private sector and local community initiatives. He urged the people of Gbarnway to properly maintain their newly dedicated solar power system so that it serves as a model for other communities across the country.